Nope, that is not me being camera shy. It is my sister, the mysterious “R”. I made a dress for R for her birthday from Simplicity 1652. It’s one of those “Amazing Fit” patterns. And that picture is, by the way, the only “decent” shot I got of R in the dress. As some other reviewers have said, the cut out gapes. Obviously the Amazing Fit pattern doesn’t tell you/ allow you to adjust for this once cut. I ended up have to put tiny darts in which the ponte hides like a trooper. But next time around I would adjust the pattern for this. Misses’ & Miss Petite Amazing Fit dress has back zipper, scoop neckline & full or peek-a-boo back. Go sleeveless, short or cap sleeves. Individual pattern pieces for A,B,C,D cup sizes ensure perfect fit. 6 – 22. I would say the sizing on this is pretty generous. Yes. I made view B with the cap sleeves and cut out back, with the tabs from view A. Yes, BUT, note that the pattern pieces have 1″ seam allowances at the sides and the instructions have you baste virtually the whole dress together first, adjust the fit, then take the basted dress apart before making adjustments and sewing up finally and trimming down the seam allowances as required. I say, just make a muslin! In fact, the directions state at the very beginning, and I quote “We suggest that you make a muslin fitting shell like the professionals do so that you can really get a great fit without the added stress of using your real fabric first. Have fun!” ?!?! But, it does mean that for lazy sewers like me you get to cut into your fashion fabric and still adjust without doing a muslin. Argh, devil and deep blue sea…. See point above for dislike. Also, the cut out back gapes (other reviewers have noted the same thing) and I ended up sewing in darts to eliminate the gape. I am not sure about the usefulness of the pockets. I am not a pocket lover in general (for dresses); with these I think it is definitely a case of form over function. Likes: I do like the casual wearability of the dress with its subtle gathers and waist emphasising button tabs. 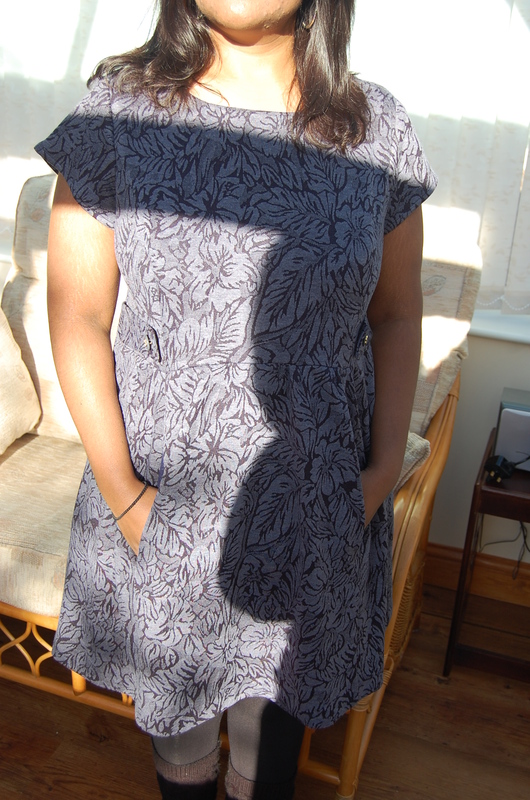 A floral patterned ponte double knit. I don’t know. Removed about a further 0.5″ from either side of the bodice following basting, shortened bodice by about 2″, pinched out about an inch from the back seam, 1″ sway back adjustment and shortened skirt by 4 inches. 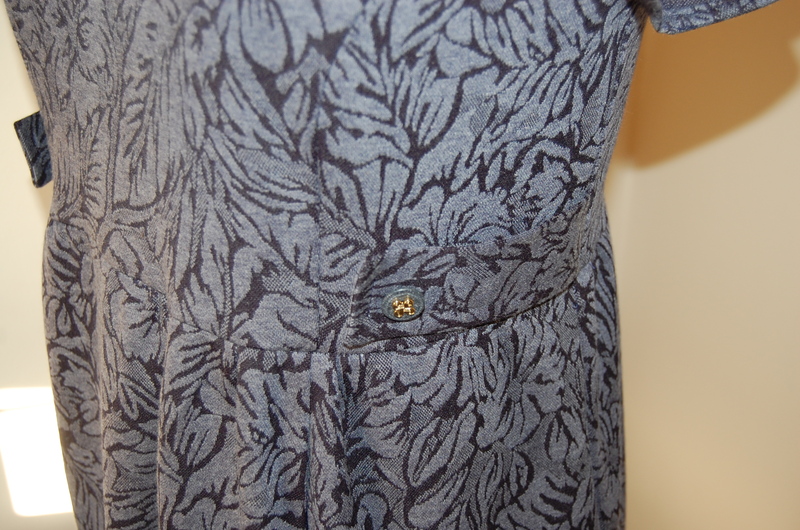 I also used a piece of navy elastic to form the button loop as I felt making a loop from the ponte would be too bulky. Note: I don’t know if the zip and button closure are really necessary; the neck is pretty large and unless you have a huge head I think you could easily pull this on and off. Now that I have a feel for this pattern I might sew it again for myself. I don’t know if I would recommend it to others in terms of the instructions. I think there are other patterns out there which would give a similar effect in an easier manner. I found the pattern frustrating, but now I have done it once I might well try and improve on a second one…. Pretty dress and so nice that you sew for your sister. 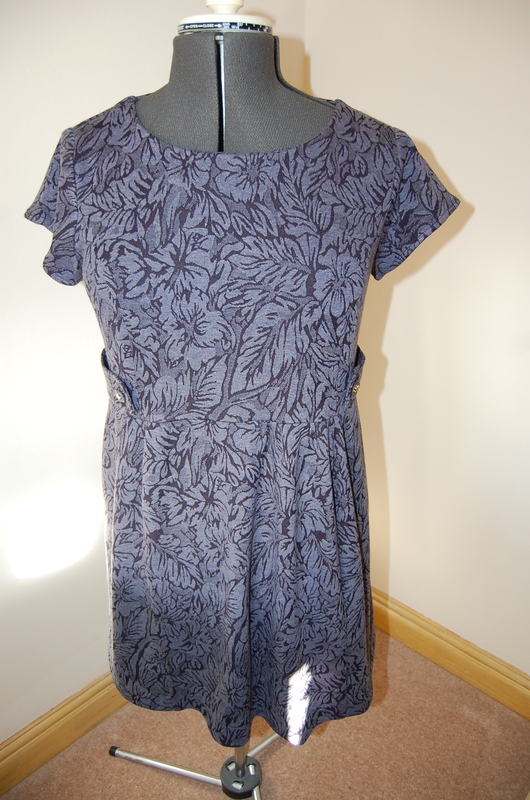 I made this dress in the summer and had terrible trouble fitting the bodice, particularly the back. I had to dart the diagonal sides at the top of the cut out too. Ponte sounds like a good option for this dress, because mine stretches out across the back and gapes by the end of the day (even with stay stitching and top stitching!). Hi Sam yes I can recall your lovely black and white version. I think next time I will alter the pattern to remove the dart equivalent. 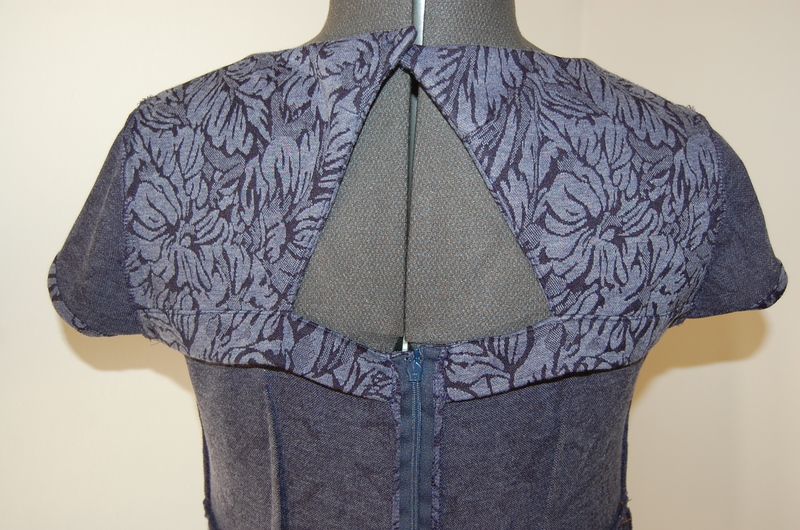 I also interfaced the edges of the dress piece as well as the facing cos I was worried about stretching. that style intrigued me and I almost made it last summer. I love the amazing fit patterns and the way they do it with the one inch seam allowance/basting to check fit is actually how I sew most dresses of any pattern. I know what you mean about the back cut out gaping, that is frequent with cut outs. A cute dress and perhaps you can repeat in the summertime in a woven fabric. p.s sewing for you sister, very nice!